Nina Matthies played at high school powerhouse Mira Costa and then onto UCLA where she was a starting outside hitter on two AIAW championship teams in 1974 and 75. She played on the USA National Team for the 1971 Pan-American Games. After college, the 5-6 standout became a UCLA Assistant Coach under Andy Banachowski and was part of the coaching staff that went to first NCAA finals in 1981. She then left to become the Pepperdine women’s head indoor coach for the next 31 years with 20 NCAA appearances, 11 conference titles, 590 career wins and one Elite 8 appearance. While still coaching the indoor game she become Pepperdine’s first Beach Volleyball Coach and won the first collegiate championship in 2012 and again in 2014. She was part of the NCAA committee that made the beach game a collegiate reality and then retired from coaching the indoor game and put 100% into beach coaching today. 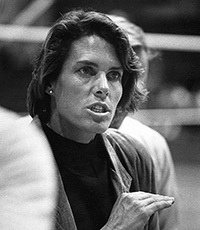 ‘Volleyball Magazine’ named Matthies as one of the “Most Influential People in the First 100 Years of Volleyball.” In 2004, she was named to the 75th Anniversary All-Era Team by USA Volleyball and is a member of AVCA College VB HOF. She also won 44 tournaments in a great beach playing career.